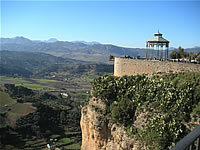 The historic town of Ronda is built on a large plateau, which looks over the River Guadalevín gorge. The gorge cleanly separates the town into two distinct parts - the medieval part and the 18th century part. Over the gorge stands a huge stone bridge - the Puente Nuevo - which, we are told, once housed a prison. This is a great place to view the open planes in front of Ronda and look down into the "El Tajo" gorge way below. Near to the bridge there is a wide paved walkway, which takes you safely along the front of the plateau (past the Parador) and offers spectacular views of the open countryside below. At the end of the walk way you will find the Mirador - or look out point - which is wonderfully presented with colourful flowerbeds and high railings where you can stand and gaze across the open planes. Just along from here is Ronda's famous 18th century bullring. It is renowned for being the oldest and largest in all of Spain. If there is not a bullfight on, the museum is open to visitors and you can take a walk around the arena and take a peek behind the scenes. From here why not walk up through the Plaza de España (where you can find a tourist information centre) to the shopping area (all pedestrianised). Here you will encounter plenty of cafés and ice cream vendors! Of course, there are also lots of quality shops, many in their traditional appearance, all there to entice you to open your purse!! Ronda is a great day trip from the resorts of the Costa del Sols as it is only 50 Km from San Pedro de Alcantara (Marbella). Take the winding "Ronda Road" from San Pedro and drive through the mountains of the Sierra Bermeja that then opens up into the Serrania de Ronda where you start to get your first views of the town. En route, there are plenty of places to stop off and take in the views or artisan workshops where you can pick up leather goods, pottery or ironwork!